It's dark by teatime and yesterday brought the first toe-crystallisingly cold day. Time for a fantasy about cruising the turquoise waters of the winedark sea, the prow of my ship cleaving the white-topped waves. But what ship's figurehead should I choose? 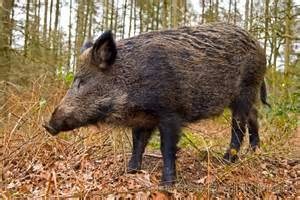 The Phoenicians liked horses’ heads, while the ancient Greeks imagined their prows as big-eyed boars charging through the undergrowth. But British sailors administering the empire round the seven seas named their ships after classical gods and heroes. Their ships' utmost prows featured carved simulacra representing the figure whose spirit was felt to animate the vessel. 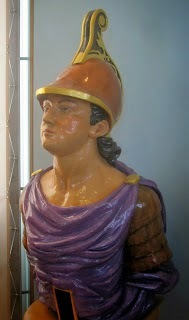 These were the images of classical figures most familiar to regular seamen and dockers. There is an enchanting collection in Portsmouth Royal Navy Museum. 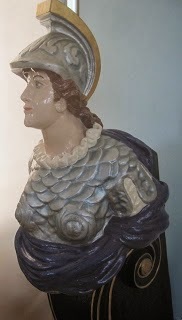 Meet the figurehead from HMS Orestes, launched in 1824. Orestes suffered from madness, which may explain why this ship was notorious for the riotous behaviour of its dissatisfied seamen. 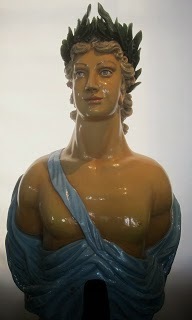 The guardian deity of HMS Apollo (1805), on the other hand, luminously led his ship to success in both the 'Opium Wars' with China and the Crimean War. 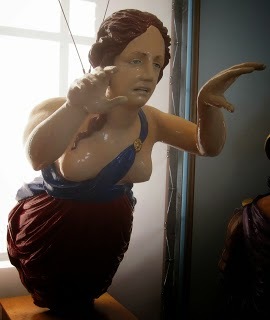 Poor HMS Eurydice’s figurehead looks rather disturbed—unlucky in her ancient myth, meeting death before her time, her ship did indeed come to a sticky end, foundering in 1878. Yet the gun-boat HMS Minerva survived wisely for decades and was used in Portsmouth harbour for operations even after her retirement at a grand old age. 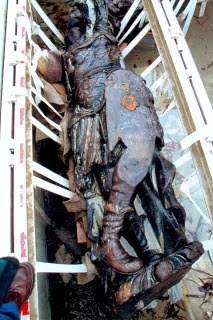 But be astounded by the 3-metre-high colossal warrior from HMS Colossus, wrecked off the Scilly Isles near Cornwall in 1798. The Colossus figure was discovered by an enterprising diver named Carmen Stevens in 2001. 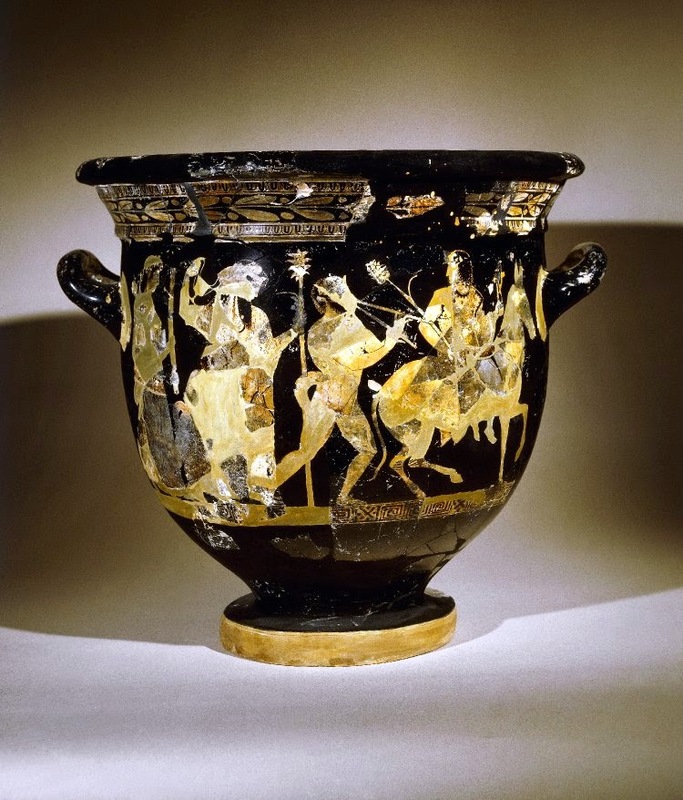 The Colossus ship's lost cargo included part of the amazing collection of ancient Greek and Etruscan vases collected by Sir William Hamilton. Some of them are still lurking on the Cornish sea-bed. Their images could change ancient theatre history. I am really annoyed that my dodgy retina means I’m forbidden to scuba dive for ever more.